Two-thousand fourteen (2014) was the year where the disconnected undercut with a modern twist to the Pompadour hit the Men Hairstyle trend like Football Fever during FIFA season. At the time, I didn't know what it was called that. 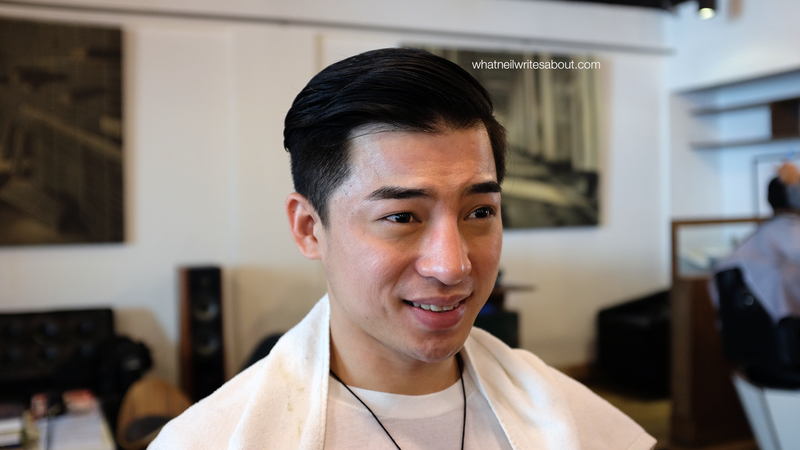 Apparently, It was the haircut that Justin Timberlake, David Beckham, and several other celebrities wore that inspired Men and some Women to do the same. Around May of that year, I was frustrated because the haircuts I was seeing on the street wasn't up to par to the online images I saw. One of my Best friends, Jed who was residing in Canada showed pictures of him with that style of haircut. He told me that you need a skilled barber and a good product to keep that hairstyle. It was then that I was introduced to the 'Pomade.' Specifically, the water-based one where it can be restyled just by wetting your hair again; moreover, it would easily come off with a simple rinse with shampoo and conditioner. I made it my mission to look for that pomade brand my friend told me about. So like any start of a journey today, I Googled it, and to my surprise, a local barbershop carried it which is conveniently laid out for me on Google Maps. 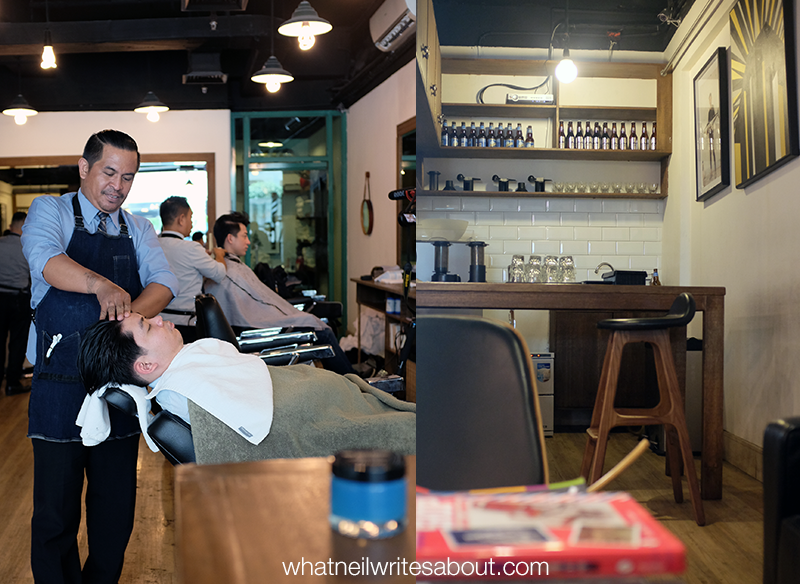 'Back Alley Barbershop' was the name and it is located near the Saudi Arabian Embassy in Salcedo Village, Makati. I texted them with the number posted on their Facebook page and asked to reserve a canister of the hair product. They replied promptly and did so as I requested. This was the beginning of a wonderful relationship with being a better man and the beginning of a relapse of a dysfunctional relationship with my wallet since STEAM sales were created. (Steams sales are the PC Gamer's dream sales where games can get discounts of up to 80% off in huge batches) My wallet never truly forgave me for all those Sales I plowed through. I kept telling myself that at least I would look good. Oh, well. So I followed the map and found this lovely place with a wonderful semi-industrial turned New York Apartment style aesthetic. It was a scene to behold. Right away you see the reception desk with all the products they carry, a lounge area where you can sit down and enjoy a drink and listen to high quality Vinyl on their turntable and right across are the Barber chairs and the Mirrors above the desk full of metal and leather utensils. The dashing young man at the reception desk welcomed me warmly and asked me if it was my first time there. Yes it was. I mentioned my reservation for a canister of the pomade. They showed it to me and I paid for it. He then decided to show us around and tell me about their services. They offer the old school style of haircut and shave. The third thing is the hungover treatment. I then decided to have my haircut here. For as long as I can remember, I was having my haircut at neighbourhood barbershops that were hole in the walls where a haircut was priced from Php 30.00 in the nineties and went up to Php 50.00 in recent years. 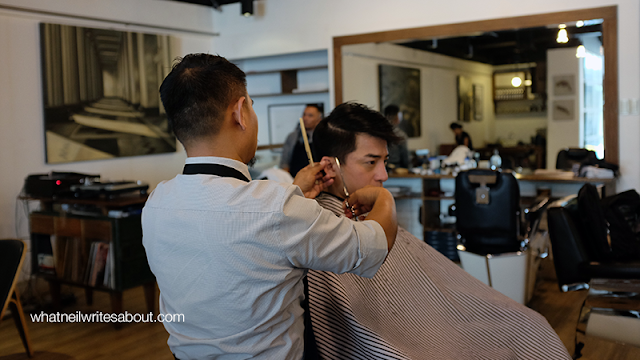 In contrast, there are barbershops in Beverly Hills, California that offer haircuts that could cost up to a USD 1000.00 and I could never comprehend how this is so. The haircut process itself is more tamed and more elegant than what I was accustomed to. If you decide to try Back Alley's Haircut, I encourage you to watch how your barber strokes the clippers/trimmers (the white and black handheld machine they use to shave your hair) and the myriad of ways and angles the barber snips your hair strands. Of course, at any time, you can talk to him and converse about adjustments to the style you asked prior. At the near end of it, you will be given a simple but effective massage on your upper body and extremities coupled with a warm towel to give you your much deserved relaxation. 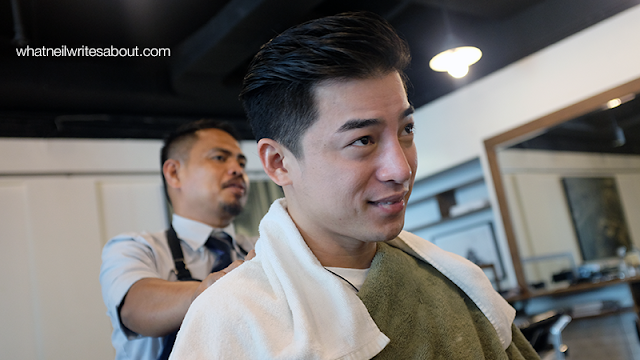 Before he does the final combing of your hairstyle, you are given an option to try out one of their hair products to keep your hairstyle in place even through the most active lifestyle. The result is not just a haircut but a labor of love! After coming back to this place for months, I decided to try their shave. I specifically stopped shaving for two weeks before to time it with my next haircut. 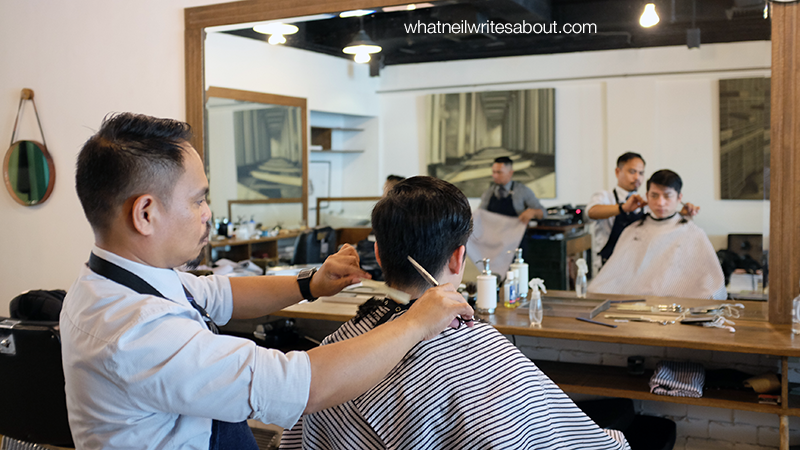 At the end of the cut, I could feel that that time has come as the tension rises slowly as the barbers chair started to recline. A towel was placed on my upper body and I started to grin from ear to ear even though I was trying so hard to keep calm and be cool. Alas, I failed. My barber at the time was 'Edwin' and he started with an application of cream on my face, followed by a relaxing face massage that ends with a warm towel that wraps your whole head. He continued with the shaving cream itself and starts to precisely and carefully shave the facial hairs that I asked to be shaven. He repeats the massage and the towel wrap but adding several after shave creams in between and finishes of with a final towel wipe. 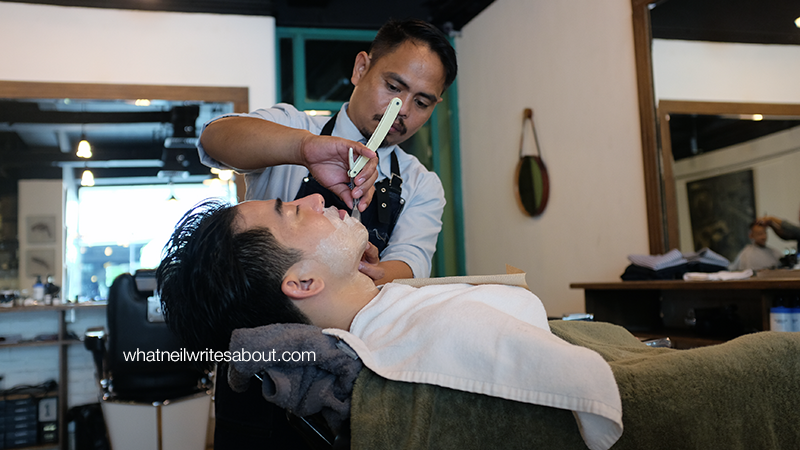 "he starts to precisely and carefully shave the facial hairs I asked to be shaven"
The Hungover treatment is a little more complex. It is a sequence of hot and cold towel applications with facial scrub, clay mask, moisturizer and other creams. I could never really understood when it was explained for the first time but I highly recommend having it! It is one of those things that is best experienced than spoken of. In fact, a lot of their patrons come for this service alone even though this is the service with the most premium. Let it be; I mean all you have to do is lie down and let the magic happen. In fact, the owners tested it themselves. They got themselves hungover and had this treatment on themselves. The list of creams is a long one and it is best explained by gentleman at the reception desk. In fact when he explained it in theory, I could only grasp it by so much. 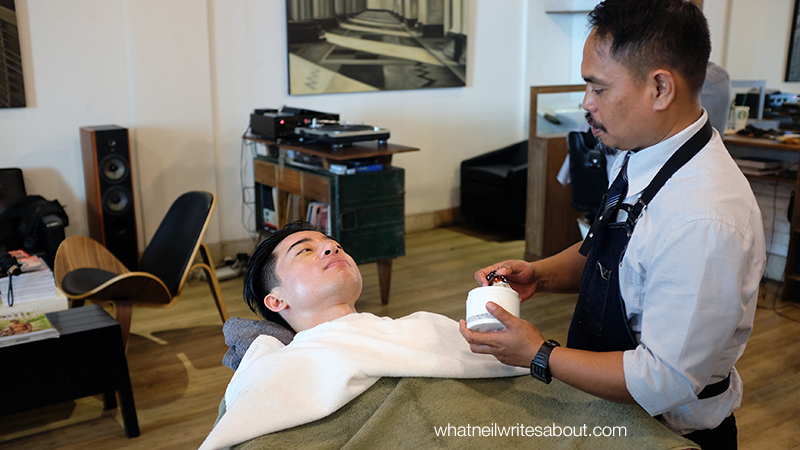 As I was experiencing it first hand, I was confused because the barber was just doing the same thing over and over, with only the temperature of the towel and the cream changing each time, yet slowly with each sequence I felt my relaxation rising significantly. Near the end of it I just wanted to sleep while I was being massaged because it was just so good that when I was awaken I could only scream 'ANG SARAP!' Even after a couple of hours after the treatment I noticed that my skin was glowing and that it had softer and better texture to it! Haircut starts at Php 250.00 - Php 400.00 but is priced at Php 700.00 together with the shave. 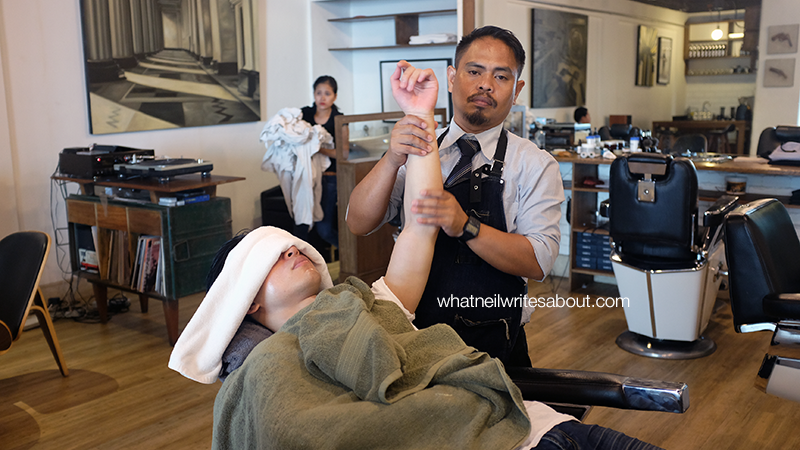 The shave itself is Php 450.00. while the Hungover Treatment (HT) is priced at Php 750.00 individually but is priced at Php 950.00 with the haircut. 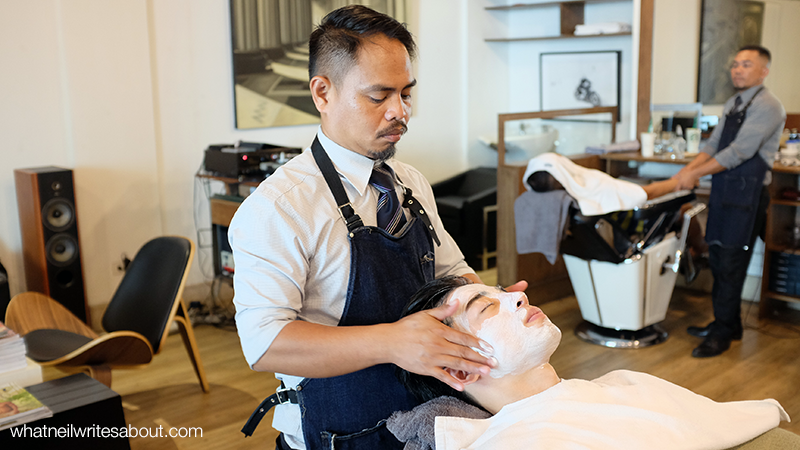 If you want an HT and a shave, it will set you back Php 1000.00, and You can have all three for the price of Php 1200.00. I personally tip my barber of the day and it is up to you if you would and how much you will be willing to give these fine gentlemen. It was because of the whole top-notch experience did I truly understand women and their salon time. In fact, I come back here every month for my haircut. I will reserve the hungover treatment for special occasions or when I really need a better pick-me-up than brewed coffee. The premium price for their service may not be justified to some but I think you should at least try it once to see if this type of thing is for you. I for one love the experience and of course the beer. It is also a good place to bond with your buddies and children. After coming here for a while, you may develop a preferred barber and I have personally tried the services of JR, Edwin and Jonas. 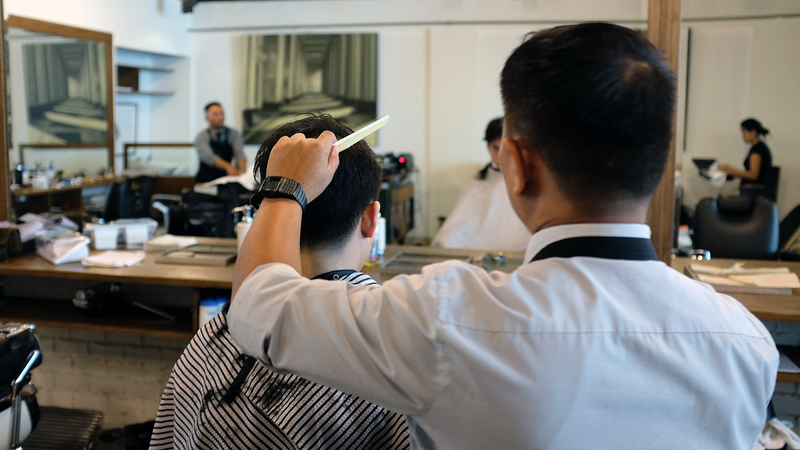 They each add their own personal style and flare to their haircuts and it will show as they start snipping your hair down, yet they are all the best at what they do. I encourage you to support their profession and let us all work together to bring old school back! Special Thank You Kenzo Ortiz and the team of Red Models and Talents !